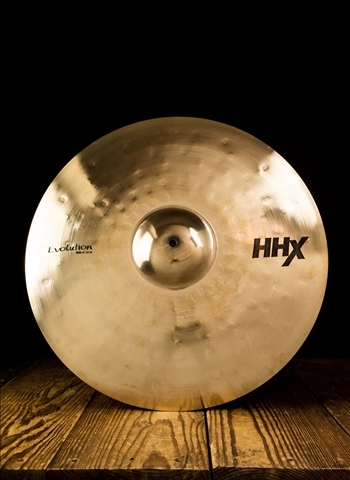 Designed with Dave Weckl, HHX Evolution is undoubtedly one of the industry's most iconic and successful cymbal lines. Evolution cymbals speak with incredible clarity and brilliance, providing a sonic context of air and atmosphere. Their feel is remarkable. Buttery soft, they respond to the slightest touch, making them extremely easy to play, even at the lowest volumes. Within these sound parameters, the 21" HHX Evolution Ride combines crisp attack and warm undertones for a shimmering Ride cymbal with excellent Crash capability. There is notable separation between the bright high end and the warm low end, for a high-fidelity sound that is both warm and cool. In fact, it is this mix that defines HHX Evolution: retaining the low end, brightening the highs, and increasing sensitivity so that the lightest touch of a stick sets it off. Evolution puts out its total sound at all times, even at very low levels. Hand crafted from SABIAN B20 bronze, the most durable and musical metal, 21" HHX Evolution Ride is protected by a SABIAN two-year warranty.